Tester: Hispanic (Columbian) with normal skin on body and prone to hyperpigmentation scars. “As it so happens, a recent freak accident in my bathroom resulted in a gash on my right knee; and provided the perfect opportunity to test Mederma (every cloud does have a silver lining! ), which I have heard for years is the best solution to eliminate the appearance of scars. 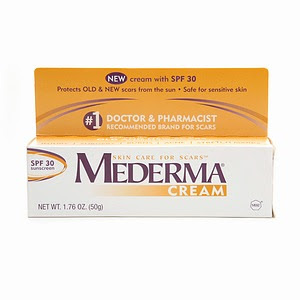 As per the instructions, I rubbed the Mederma on my scar 3-4 times a day for 2 months. I applied in the AM, around lunch, in the evening and right before bed. At about the three week mark, I could definitely see an improvement in the size and color of my scar. At 6 weeks the scar was much lighter and all I could make out was the outline. However, I continued to apply as I got the scar during the summer and this new version has sunscreen, to prevent the scars from getting darker. This version is a medium-weight white cream which blended into my skin quickly, was not greasy and left no color on my skin, (but the original Mederma Skin Care for Scars, Topical Gel is clear). At the 2 month mark my scar felt and appeared very smooth and the color blended into that of my skin so well that I could barely see it. I now apply just a few times a week and will continue to another month or so. This is a product that really works and is worth every penny. I would say this is a must have for the medicine cabinet and especially if you have active kids!” L.V. 1. For the average cut that leaves a scar e.g. household accident, insect bite, minor burn, skid from fall, etc. you WILL need to use at least a month (minimum) using 3-4 times a day. Also we recommend using the SPF version in the summer (to help prevent the scar from getting darker). 2. This is NOT meant for stretch marks.